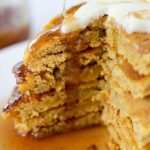 This pumpkin pancake recipe is light, fluffy, and full of pumpkin flavor! Topped with cinnamon caramel syrup, these pancakes are full of Fall flavor! Whisk 1 1/2 cups of the milk, egg, pumpkin and maple extract together in a medium bowl or 4 cup glass measuring cup. Whisk flour, sugar, spices, baking powder, baking soda, and salt together in a medium bowl. Add the wet ingredients to the dry ingredients and mix until just combined. Adjust batter consistency with remaining half cup of milk. The batter should be pourable but not thin. Heat a pan or griddle on low heat. Add a small amount of butter or oil to the pan. Pour 1/4-1/3 cup of batter for each pancake and gently spread out the batter until the pancakes are approximately 4 inches in diameter. Cook on both sides until light golden brown. Add butter, sugar, and milk to a 2.5-quart saucepan (see note). Bring to a rolling boil (see note) and boil for 2 minutes. Off heat, add baking soda and maple extract. Whisk to mix together, the syrup will bubble and foam vigorously. Whisk in caramel and cinnamon. Let rest for a few minutes to let the foam settle down. Store in an airtight container (like a mason jar) in the fridge, reheating and stirring before use to melt and combine. A 2.5 quart saucepan is the smallest size you will want to use for this recipe. It will bubble and foam up quite a bit once the baking soda is added. • A rolling boil is a boil that does not break even when you stir the liquid. It will take about 5 minutes to get the mixture to a rolling boil. I set a timer for the 2 minute boil step.